My long awaited Kindle 2 showed up yesterday and Sally wasted no time unboxing it. The Kindle 2 is a second generation ebook reader from Amazon.com. Instead of buying normal paper books at the Amazon.com store, you buy Kindle ebooks and have it delivered wirelessly to your Kindle in about 60 seconds. 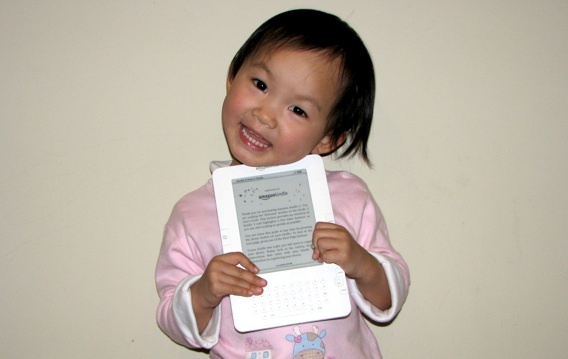 The secret to the Kindle is its E-Ink electronic paper display. Unlike a computer display, the Kindle display is not back lit and won’t fatigue your eyes. It’s the closest thing you can come to reading a paper book without actually reading a paper book. I haven’t dug into the Kindle much because, well, I can’t register the thing because the Amazon Whispernet wireless technology doesn’t have coverage in Canada. With no Whispernet, the way to register a Kindle would be to log onto Amazon.com and enter the device serial number. However, when I tried that, it said the device was registered to Market Leverage because they were the one who sent it to me. Since this was a gift, the only way to register the Kindle is by using its Whispernet system, which only works in the United States. As luck would have it, I happen to be in Seattle right now. The Kindle has been registered and I’m searching for some good books to download. Once the Kindle has been registered, there is no need to worry about not having access to the Whispernet connection. When I jet off to China this Friday, I can still buy Kindle books by shopping at Amazon.com and downloading the books to my computer and then transferring them to the Kindle via the supplied USB cable. I’ll have a full review of the Kindle once I have more time to play with it. In the meantime, check out the cutest Kindle unboxing video ever made.